I feel kindred spirits as I walk past other mothers pushing wheelchairs, and I know that tired look in their eyes…And I realize we aren’t alone in this. 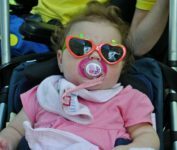 The support The Darling Home for Kids provides goes beyond nurses caring for special needs children. They save families.